It’s hard for me to believe it’s been over 3 years since I posted anything, but I think Facebook has ruined me with the quick post attitude. A few words, a quick photo, and voila!, out to the world. Here, I have to sit and think a little bit, because people who are here, like you, may want to know more. So, I am back, and will try to sit a little and think, and express. I have not stopped potting…on the contrary, I have been busier than ever, that is why the posts have played second fiddle. I have stopped doing some of the eight shows I was doing, and am spending more time in the studio, and welcoming folks to visit. It is a much nicer way for me to interact with folks, and they, you, get to enjoy the gardens around the cabin studio. 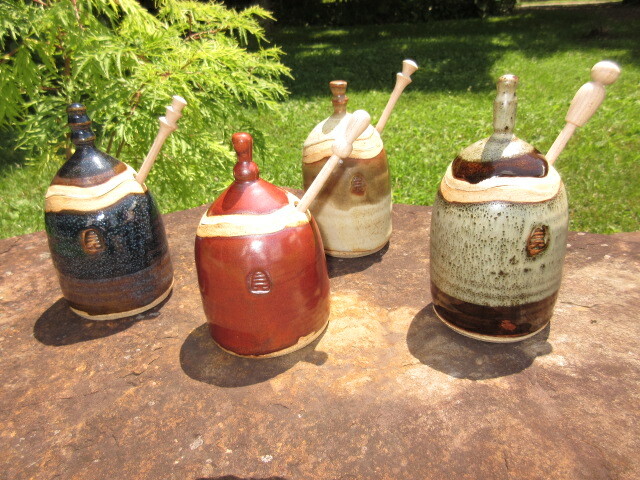 So after the Indiana Artisan Show in Indianapolis, I was off to the Ozarks to do a wood firing with friends. This is where I do my mid-19th century folk pieces, the ugly face jugs and Temperance snake jugs. As seen in this image, the wood burning and wood ash make these pots look exactly like they would have looked in the time period. Although not for everyone. 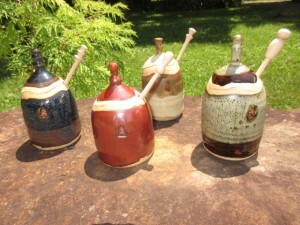 the history of these jugs appeals to me immensely. 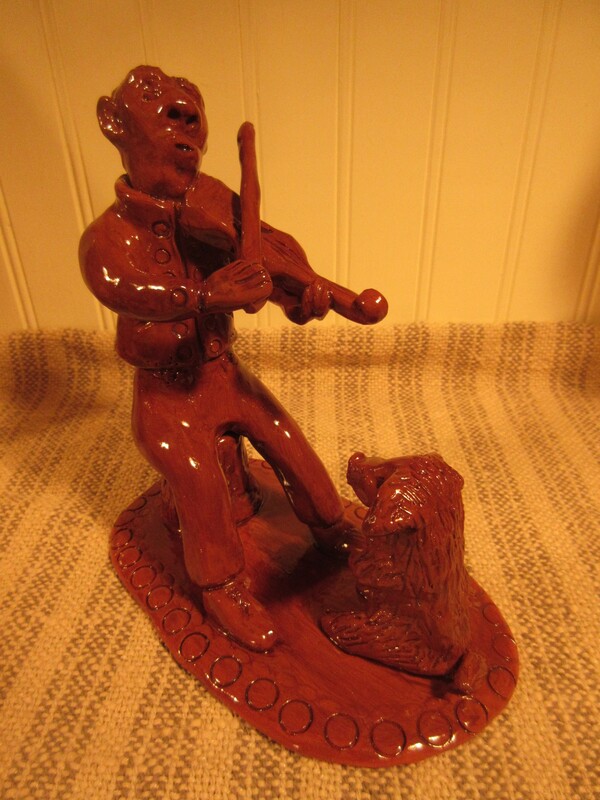 I also am enjoying new redware pieces; in addition to throwing pieces, have continued to do some fun little period sculptural pieces, as seen in the fiddler and dog. 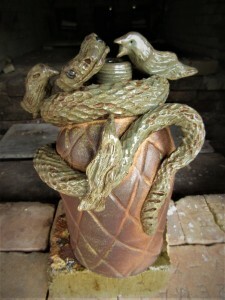 These were also mid-19th century, used for paper weights and doorstops. And, I have not given up on creating functional stoneware pieces….I try to make them beautiful, so they can be left out on the table as little works of art. Here, the honey pots are thrown as one piece, lids cut right into the form…this allows the lid to only fit one way…the right way. The dippers are hard maple and hand-turned, yes, hand-turned by a wood worker friend of mine in Princeton Indiana, Keith Armstrong. So, there’s a little of what’s going on, and I promise, I will start posting more. But in the mean time, if you want a little glimpse of what else has been happening, Like the Fb page, for short, up to the minute posts.